Evan Spencer, center, and Adolphus Washington, right, celebrate Saturday with their teammates after Ohio State defeated Wisconsin 59-0 in the Big Ten championship at Lucas Oil Stadium in Indianapolis. Ohio State will compete for the national championship. The field for the first-ever college football playoff was announced Sunday, and Alabama, Oregon, Florida State and Ohio State have made it — leaving out TCU and Baylor. Oregon is ranked first in FPI, although just barely over Alabama. FPI also thinks the Ducks are helped slightly by getting to play No. 3 seed Florida State in the semifinals; it has Florida State rated below Alabama’s opponent, No. 4 Ohio State. There is no runaway favorite. 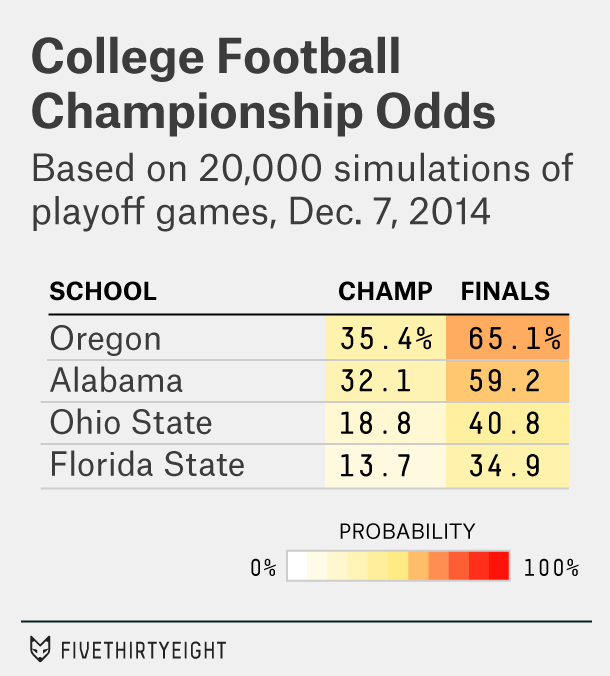 Oregon has a 35 percent chance of becoming the national champion, according to FPI, with Alabama at 32 percent, Ohio State at 19 percent and Florida State at 14 percent. As for which teams made the field, one of the big things we were going to learn this weekend was how heavily the committee weighed its previous rankings when deciding on its final ones. Because the playoff committee is new, the FiveThirtyEight playoff model was based on a historical assessment of the Coaches Poll instead. In the Coaches Poll — and the AP poll — the rankings are quite “sticky” from week to week. Voters in those polls rarely engage in top-to-bottom reassessments of the field; instead, they’ll demote teams after they lose and sometimes move them up an extra position or two after a big win. Otherwise, they’re left in about the same order. Based on that assumption, Ohio State had a decent shot to make the playoff after its big win against Wisconsin in the Big Ten championship. But the model had TCU favored to make the playoff because it had been ranked No. 3 by the committee entering the weekend. The model had No. 4 Florida State as the more vulnerable team instead, simply because it had been ranked lower by the committee to begin with and its win Saturday — it beat Georgia Tech 37-35 for the ACC championship — was the narrowest of anyone in the top six. Instead, Florida State moved up to No. 3. And TCU was overtaken not just by Ohio State and Florida State, but also by Baylor (which missed the playoff but was given the committee’s No. 5 ranking for posterity). What the committee did last week — promoting TCU into the No. 3 position ahead of Florida State — proved to be a head fake. In other words, the committee appears to engage in a more thorough reassessment of the teams with its final rankings. For better or worse, it’s more concerned about getting the “right” answer in the end than in being consistent from week to week.